Chimpanzees in Uganda may have changed their hunting strategy in response to being watched by scientists. While studying the animals, researchers documented very different hunting habits of two closely neighbouring chimp "tribes". "Sonso" chimps hunt in small groups for colobus monkeys, while those from the "Waibira" troop hunt solo and catch "whatever they can get their hands on". The findings show how sensitive chimp society is to human presence. Biologists who have followed and studied these animals for years think that work may have disturbed the group hunting that seems key to chasing and catching colobus monkeys. 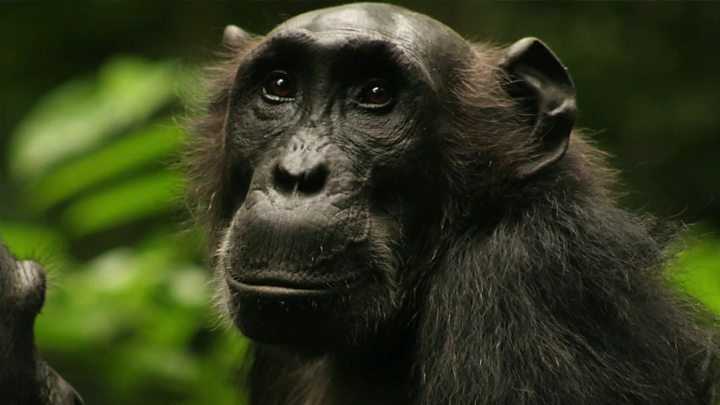 Lead researcher Dr Catherine Hobaiter, from the University of St Andrews, said the Waibira group's behaviour might have changed to a more "opportunistic" strategy because those chimps were much less used to the presence of human scientists. Speaking to BBC News from Budongo Forest, in Uganda, where she studies both of these chimpanzee groups, Dr Hobaiter said Sonso and Waibira chimps "shared territorial borders", so she would expect their food sources and prey to be the same. "The main thing that's different about them right now is how used to having humans follow them around the forest they are," Dr Hobaiter said. "For Sonso - most of the current generation of adults were born with us being there, so they're really incredibly relaxed about our presence. "But [for] Waibira - some of the young ones have started to grow up and become very comfortable with us, but some of the adults would be 30-40 years old when we started, and five years of us following them round is a fraction of their lifetime. "It just takes time with chimpanzees." At other sites where researchers had begun a similar habituation and close observation of wild chimp groups, Dr Hobaiter said, a similar "pattern" had emerged. "They hunt for lots of different species, then later they seem to switch and settle in to hunting colobus." Key to this could be the natural tendency of chimpanzees' groups to be territorial and wary of newcomers. "I think that makes it that much harder for them to accept our presence as being a part of their lives," said Dr Hobaiter. "Long-term research with wild chimpanzees brings real conservation benefits, but we have to remember that our presence can affect their behaviour." Dr Hobaiter said that - as well as conserving endangered primates and the forests they lived in - directly observing and recording chimpanzee behaviour was the best way to understand the origins of human language and social structure. "But we need to ask - should we be going in there [to follow the chimps]? "We can do amazing things with camera traps, remote microphones and drones - it's getting much easier to get good quality data. "Part of our work is to understand what our impact is and to try to minimise it."